Be the first to share your favorite memory, photo or story of Geremiah. This memorial page is dedicated for family, friends and future generations to celebrate the life of their loved one. Geremiah Olvera, 19, passed away Monday, November 5, 2018 due to injuries sustained in a vehicular collision in Coats, NC and was called on to Heaven to be with his Lord and Savior. 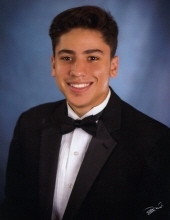 He was a 2018 high-school graduate of Cape Fear Christian Academy and a freshman member of Kappa Alpha Order Fraternity and the Army ROTC program at Campbell University. His life, friendship and golden smile was a gift to many and his kind and loving nature made him a son that a parent can only dream of having. He is survived by his parents, Shawn and Khristen Rumberger, Anthony and Stacy Olvera, sister; Savanna, brothers, Gabriel, Micah, Julian and CJ, maternal grand-parents; Papa Lani and Barbara Galarsa, Larry Galarsa, paternal grandmother, Debbie Olvera. Family and friends are invited to attend a memorial service that will be held at 3 pm Saturday. November 17, 2018 at Butler Chapel located at 60 T.T. Lanier St. Lillington, NC 27546 on the campus of Campbell University in Buies Creek with Dr. Johnny Sexton presiding. Arrangements are by Skinner & Smith Funeral Home in Dunn. To send flowers or a remembrance gift to the family of Geremiah Olvera, please visit our Tribute Store. "Email Address" would like to share the life celebration of Geremiah Olvera. Click on the "link" to go to share a favorite memory or leave a condolence message for the family.